Standard equipment with custom designs… energy efficient impact blasting…in-line capability. Those are qualities you can expect when you specify BLAST-IT-ALL. Designed for applications such as cleaning castings, forgings, structural steel, and heat treated parts, BLAST-IT-ALL systems give the finish needed and may be programmed to be tied in with existing controls or designed as part of any automated system with its own control unit. Describe your need….BLAST-IT-ALL engineers will design a system to fit that need. Abrasive media used in BLAST-IT-ALL equipment are as much a part of the design as cabinetry, work flow, turntables, or controllers. Abrasive characteristics influence the finish, speed of cleaning…even the wear rate of the parts being cleaned. The right operating mixture of abrasive media, although constantly changing itself as a result of the work being done, is critical to top performance of a cleaning, peening and finishing system. And with robotic engineering playing a major role in today’s industry. 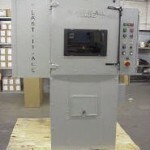 BLAST-IT-ALL systems are ideal for loading or unloading applications on an assembly line basis. Concept-designing covers purpose, function, and results…all vital BLAST-IT-ALL Automated Blasting System. Metal Cleaning, peening, and finishing for the 90’s. Every day, BLAST-IT-ALL engineers discover new technologies and designs that meet your requirements. Whatever your need, it can be filled. Blast iron and metal woods in golf equipment manufacturing. Put a fine cosmetic finish on stainless steel products or give a mat/satin finish to steel products used in the food and dairy industries.A BLAST-IT-ALL system has been used to reprocess heat-shield tiles on a space shuttle mission. The possibilities are endless! BLAST-IT-ALL has but one objective…to see that every dry blasting that leaves the plant meets the customers total needs. And that’s no small order. Each unit manufactured is backed by a quality control, engineering and inspection team. Its their job to give daily attention to every detail in the manufacturing process. And with national warehouse distribution, your system can be installed and fully operational within a matter of days. The BLAST-IT-ALL story begins and ends with service…a special kind of service thats made the name synonymous with high-quality dry blast systems. This unique approach adds new meaning to the well-worn term personal service. From the smallest idea to layouts to total manufacturing, the service focus is on you…the customer. And customers tell us they appreciate the responsibility we assume. Drawing on our experience early often leads to considerable savings of both time and money. To a BLAST-IT-ALL field representative, customer service means more than being there when you need him to troubleshoot an old installation or make recommendations on a new one. A professional staff can also be counted on to assure a high-quality BLAST systems that performs the job you want done…economically. 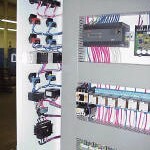 Next time, specify BLAST-IT-ALL Programmable cleaning, peening, and finishing systems for your industrial application. Call or write today for product literature and complete specifications. 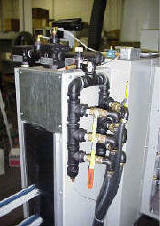 This system was designed to blast panels up to 16″ tall, with no length requirement. 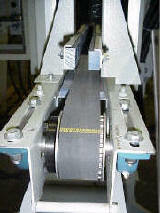 A dual belt (split conveyor) was used so the belt would not be damaged by the blast. Three (3) blast guns attached to an adjustable arc gun device are used on each side of the cabinet. 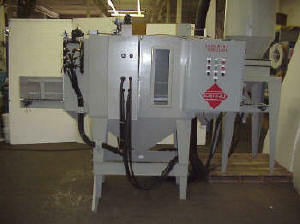 Adjustable speed, dc drive gear motors operate each gun mover and the conveying belt. The recovery system consists of a 1200 CFM reclaim with screen drawer and multi gun outlet. A 1200 CFM, two (2) cartridge, reverse pulse jet dust collector is used to provided conveying air.